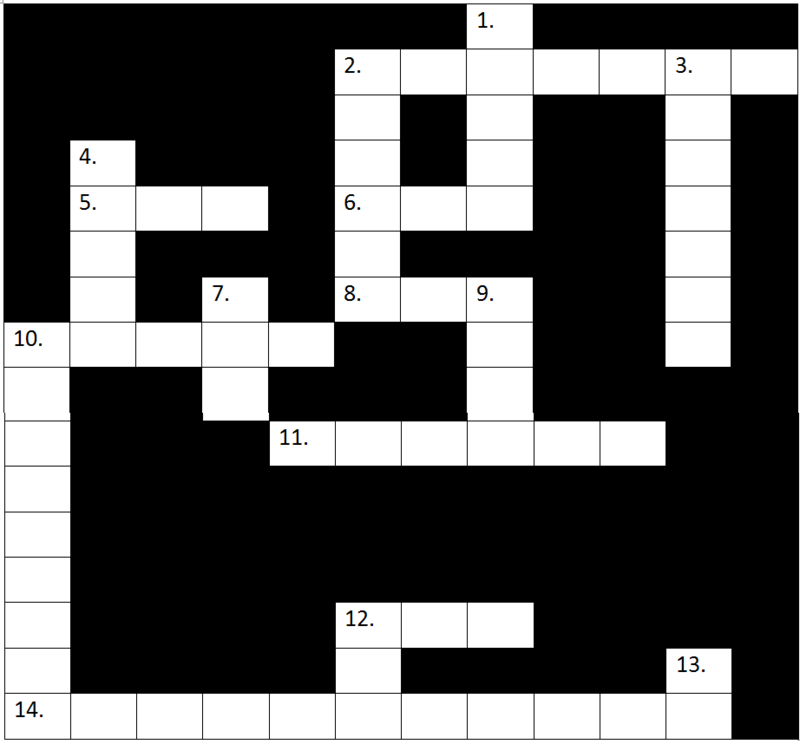 This isn’t your usual crossword; it’s one that has a theme. Epilepsy: It’s a neurological disorder that affects 1 in 10 Canadians. This crossword has terms that relate to epilepsy. Each clue will give you more information. The answers will be posted soon. 2. These seizures are known as “complex ________”. They originate from the temporal lobe. They usually start with a blank stare and are followed by repetitive activity. The person might look dazed and might make sounds like muffled speech. They usually last only a few minutes, the confusion after one can last longer. Don’t think that the person is drunk if you see one. And there are a lot of different types. Some people might just repeatedly twitch a body part, but someone else might go into a gagging phase. 8. An Electroencephalogram. It’s used to scan the brain and another test to diagnose epilepsy and check if someone is eligible for brain surgery. For this one the wires are glued to your head. Sometimes it might be for one or two hours, but there are other times when it might be for two days or two weeks. You never know what epilepsy will bring. 10. The part of the body that epilepsy affects. When someone with epilepsy is having a seizure, it means that his muscle is firing too many neurons. Some people say that when someone has a seizure it’s because they’re thinking too much. 11. When these are flashing, some people get seizures. A lot of people have a cause for a seizure, AKA a trigger; but for some people, their seizures have no triggers at all; they just come. A trigger is usually things like not getting enough sleep, missing medication, or not eating enough; but there are also triggers like when these are flashing. 12. A lot of patients with epilepsy go through this scan to confirm that they’re diagnosed with epilepsy and to check if they’re eligible for brain surgery. It involves going through a tube and hearing loud noise. People with cancer and other diseases/disorders often go through this scan too. It uses magnets so you have to take off all your metal jewellery and other metal objects before going in. If you have metal objects inside your body before going into one you have to tell your doctor/technician because the “Magnetic Resonance Imaging” might move it. 14. This doctor is one who specializes in the nervous system and the disorders affecting it, usually the first specialist that most people with epilepsy see. 1. There are lots of different ways to _______ epilepsy. One way is through medication. Some people are able to control their seizures using just one or two different medications. They’re the lucky ones other people have to go through more extreme measures. 2. This is a colour. It’s also the official colour of epilepsy. In 2008 Cassidy Megan founded the day named after this colour with the help of the Epilepsy Association of Nova Scotia. Now it’s international. On March 21, 2012 a Private Member’s Bill introduced by Geoff Regan and seconded by Kirsty Duncan passed unanimously; March 26 became officially known as the Day named after this colour in Canada. 3. These types of seizures are also known as Petit Mal. They usually occur in young children. They begin with a blank stare but might be accompanied by chewing movements. Sometimes people think that these kids are just daydreamers who space out a lot. 7. According to Section 203.1 of The Highway Traffics Act in Ontario if a doctor says you have a medical condition you can’t drive. Epilepsy is one. But if your seizures only come while you sleep or immediately after you awake, you can drive. You can also drive if you’re seizure-fee for this many months. 9. Vincent Van ______ was a great painter. He was born in Belgium in 1978. As a post-impressionist he’s been called one of the most original painters. He only sold one painting during his lifetime, but know his works are collectibles. And to top it off, he had epilepsy. 10. Born in Germany in 1770, He was one of the greatest composers of all time. He lost his hearing in 1801 and was soon completely deaf, but he still continued to conduct and perform. And he’s another famous one who didn’t let epilepsy stand in his way. 12. A Grand _____ seizure is also known as known as a Generalized Tonic-Clonic Seizure. When one occurs, the person usually becomes rigid and falls. He might lose consciousness, but after the seizure he’ll regain full consciousness. 13. This scan, a Computed Tomography or Computer Axial Tomography (CAT) is also used in the epilepsy diagnosis process and surgery testing process. The difference between the process of a Computed Tomography scan and a Magnetic Resonance Imaging scan is that in a Computed Tomography, you’re going through a donut shaped instrument, but in a Magnetic Resonance Imaging you’re in a tube. This entry was posted in Crosswords, Epilepsy and tagged Absence, Canada, Education, Epilepsy, Geoff Regan, Health, Kirsty Duncan, Seizure by Rahman. Bookmark the permalink.